This 100% nylon raglan sleeve vintage dress is a Travel-Lite by Boutique and was made in the USA. It has a 21 1/2" long front zipper and a 1 1/4" wide mandarin style collar. There are also two side seam slit pockets. It has a flower and leaf design in dark blue, creamy yellow-bone, light brown, black (the line design), baby pink, and fluorescent pink. The tag says size L.
Because of the styling, it would fit best on a Small-Medium. It can be worn with boots if you're going for the '60s mod look, or sandals or strappy heels. It can also be worn over jeans. Change your accessories and lower the zipper for evening wear. 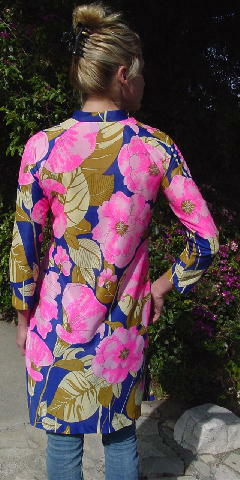 There is a fabric and color matching long dress/swimwear cover-up. It's wash and wear, packs easily, and doesn't take up much room. A model wore it when vacationing for several weeks on a yacht in the Mediterranean and for quick weekend trips. neckline to end of sleeve 26"
shoulder to hem 36 1/2"